I am tired.... beat... and my feet are really sore. Recovering from the 6.5 mile hike is only the half of it. My stomach is recovering from a quick, on the way to our destination nacho plate. Yes, I said Nacho Plate. It was 7 pounds of beans, cheese, chips, salsa, chilies and a whole lot of other do-dads. I just skimmed the surface of that monster, and now I am paying for it, several hours later. I should have opted for the soup and salad. Note to self: When on vacation... stick to your safe diet, no matter how big the temptation. And do not expect belly to feel happy while hiking for 3 hours in the hot sun, up and down cliffs after eating something like the 7 lb. nacho plate. I will stop whining. The walk today was gorgeous....stunning. Beautiful to stretch the body's limits. Thankful for the fresh air around me. Thanking my body as it made it's way up and down the rough cliffs of Devil's lake. 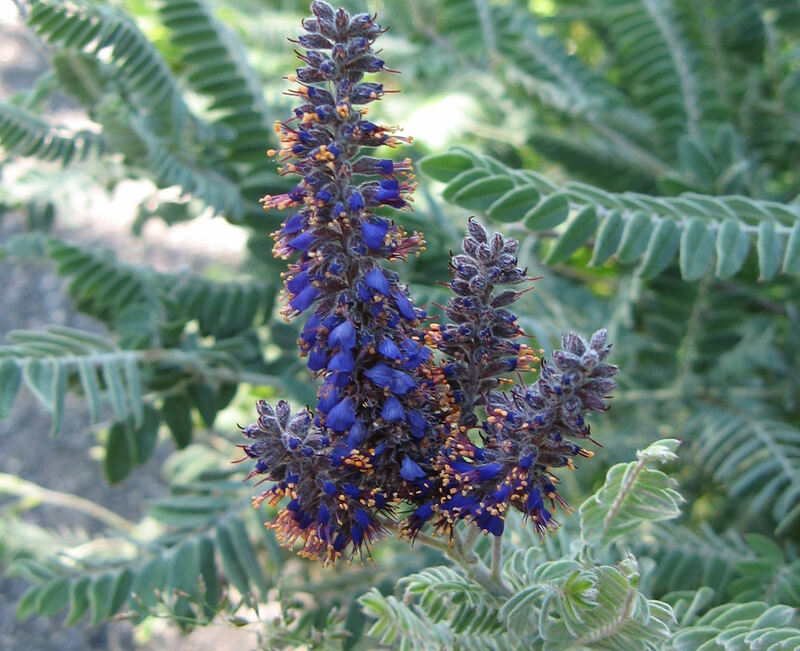 Amazing flora. Gentle gurgling creeks, wildflowers in full bloom. Simply serene. Make smoothie because there is nothing else at this point that your tummy could handle. I ran in the kitchen door took a hot shower with my favorite sandalwood soap. Showers have to smell good too! I quickly slipped into comfy clothes and my pink slippers. Then my husband offered to help me whip up a smoothie. He was suffering from post-burger-hike syndrome like me. Glad we were on the same page for supper. lots of greens...1/2 pound. Use local and organic if possible. This lucky smoothie was privy to Harmony Valley Salad Mix.... they are one of the pioneers in CSA. p.s. We just came back from a week long R&R in sunny Florida. Inspired by all of the key lime pies I tested, I will be whipping up a key lime, raspberry layered pound cake for a family gathering on Friday.... I can't wait! 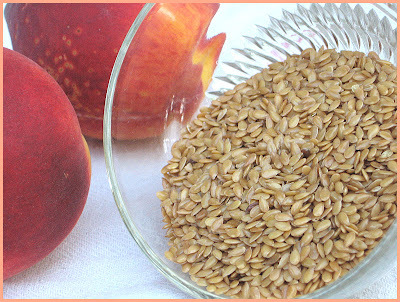 Okay I have heard for YEARS that flax seeds and their oil content are sooo wonderful for us...blah blah blah. 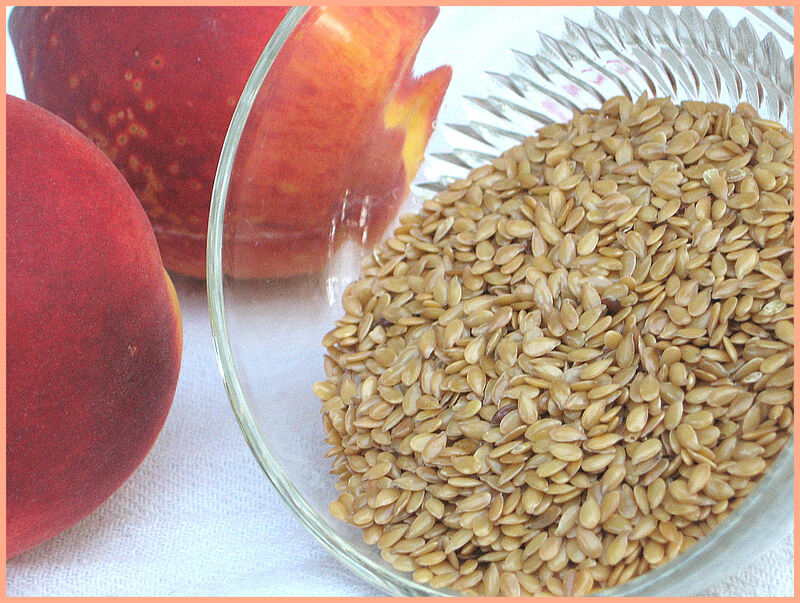 I have never found a flax seed or flax oil that I have liked. I have swallowed the oil, holding my breath and making faces just to get it down. 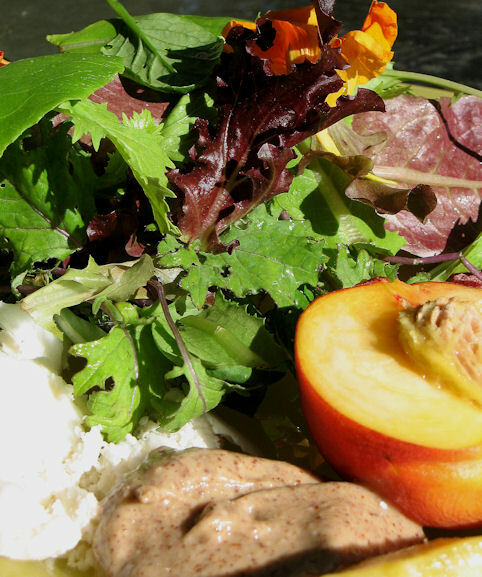 I have tried ground flax meal, I have tried to mask the flavor of the oil in salad dressings and still I am not sold. I have tried unsuccessfully to try and chew these little buggers.. and it is nearly impossible. Maybe chocolate dipped? However I am now turning over a new leaf. I am embracing this tiny little seed and all of it's wonderful glory! 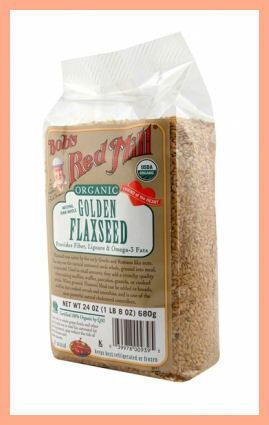 Golden Raw Flax Seeds.... my new friend. Who would have ever thought something so righteous as the flax seed would befriend someone as sassy as me. But it just happened, just like that. There I was in the grocery baking aisle, and this cute bearded gentleman was beaming down from the 4th shelf. It was Bob's Mill Organic Golden Flax Seeds. I think I bought them just because they said Golden.. and I fancy myself a sucker for glitzy things. 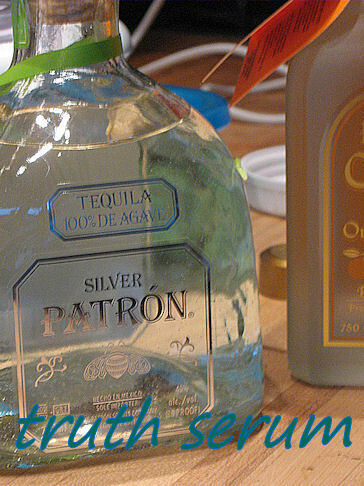 So into the cart it went and on to my counter for it's next move. Would you believe it...for 2 months straight I have been throwing into my morning smoothie 2 TBS of these lovely little seeds...grinding them up to a pulp in my Vitamix and enjoying their health benefits. Seriously... I have noticed some effect...(I think). Being someone who needs to include as much anti-inflammatory foodage as one muster into their diet... these little golden gems were a new found friend. My breakfast is truly a smoothie, every day.....I love it.. There are so many ways to pack goodness into a morning drink. I will list my current favorite below. Enjoy.. and please, do know that I understand your dislike of these little friends... just try them and let them work their golden magic. Throw this all into your Vitamix and let her fly... Sometimes I throw in an ice cube or 2. Depending if I want it cold or not. 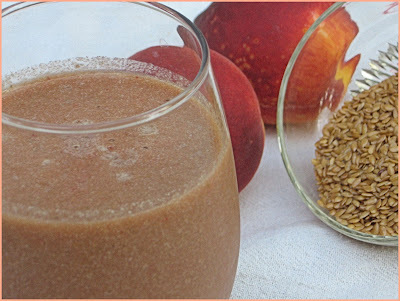 Enjoy, drink up and be on your merry way for a fantastic day with your new best friend.. Flax Seeds. How to please your daughter on her 13th birthday! Clean house like a mad woman... hide things in closets. Arrange and rearrange back porch furniture and plants as if the Dalai Lama was arriving. Purchase crazy colored nail polish at Walgreens for party favors. Can't forget the balloons and special napkins. What would a birthday be without balloons. Chauffeur around 6 teen girls for giggles and supper to local pizzeria. Let them run wild until a bit too late. Wish her happy birthday and get some shut-eye. Note to self: Remember ear plugs for the next slumber party... you will get to sleep faster. I grew up in a town where we were blessed with really good Danish bakeries. One of these bakeries made the best Danish Layer Cream Cake ever. It was what you always wanted your birthday cake to taste like... So delicious, a spongy cake with this amazing filling and cream... sometimes raspberry, sometimes lemon custard and always whipped cream. I think I have finally found the cake that pleases my senses enough that I would make it every week if I had the time. Unfortunately I am on a gluten free diet,,, the no fun diet... so I end up taking a bite to make sure it is palatable and then...I go to bed dreaming about eating it, breathing it and eating it again. Thank goodness for hungry and appreciative mouths. What makes this cake special are the egg whites...oohh how they make this cake a big giant sponge, able to soak up the flavor of the ripe June strawberries. 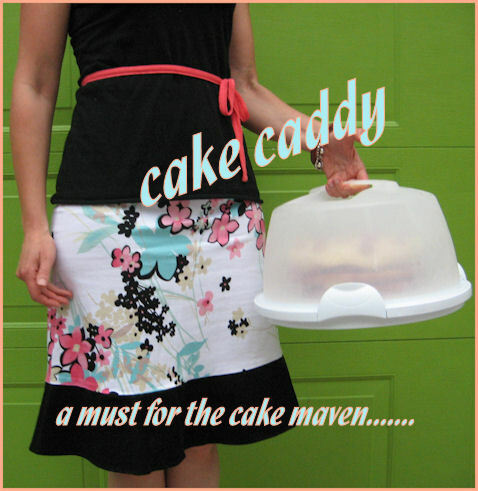 The cake recipe comes from a 1957 cookbook put out by the Journal Times in Racine Wisconsin. Beat egg yolks well, add sugar, cold water and vanilla. Add melted butter. Sift dry ingredients and fold into egg mixture. Add lemon juice. Fold in stiffly beaten egg whites (you want nice soft peaks when whipping your whites.) Pour batter into 2, 9" cake pans, buttered & floured, and lined with parchment paper. Split your batter 1/3 in one and 2/3 in another. Bake at 400 degrees for about 15 minutes. The cake with the The cake with the 1/3 batter will be done in 15 minutes.... the pan with 2/3 batter will take a bit longer....around 20-25 depending on oven. You will start to smell cake and it should be pulling away from side of pan and a bit golden /brown. Let cool for 10 minutes, tip upside down and let cool on wire rack. Split the larger cake with long serrated knife. Take about 1/3 of berries, top them and place into food processor. Turn on until you have a puree. 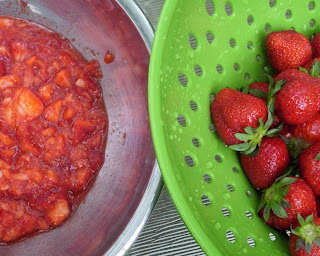 Pour puree of berries into a heavy-bottomed sauce pan, add about 1/4 cup sugar and let simmer for quite some time, 30 minutes with continous stirring. You want the puree to reduce down to a thick, sweet berry sauce... you do not want this runny as this will be the layer for you cake. (not quite as thick as jam consistency) Taste for sweetness add more sugar if needed or desired. Cool. Take another 1/3 of berries, top them and place in the food processor, pulse until just diced up into small pieces. Place in bowl. Whip the cream with added sugar and 1 tsp. of vanilla. Add sugar sparingly as good organic whip cream is so satisfyingly sweet you often do not need to add sugar. Get layers ready. Lay first layer down and cover cake with the puree. Spoon it on and watch it soak into your lovely cake. Next add a layer of your strawberry pieces. Carefully add whip cream and then another cake layer. Repeat process with the rest of strawberries and cream. Place final cake layer on top. Place bamboo skewers into cake so it will not slide and cover the rest of cake top with whipping cream. This part is essential!!! You can easily lose a layer.. Use remaining strawberries to top the cake. Cover and put into fridge to set. You could frost the sides... as this would cover up any of the filling squeezing out of the cake, however, part of the appeal of this cake is the juiciness of it. It cries... chin dripping berries...taste me! Let the cake sit in fridge for a few hours or serve immediately. Here she is the beautiful birthday girl! Thinking about what she is going to wish for! I caved. My family says I am a pushover.., and at a recent trip to Penzys I bought the big guy. An entire 16 oz. 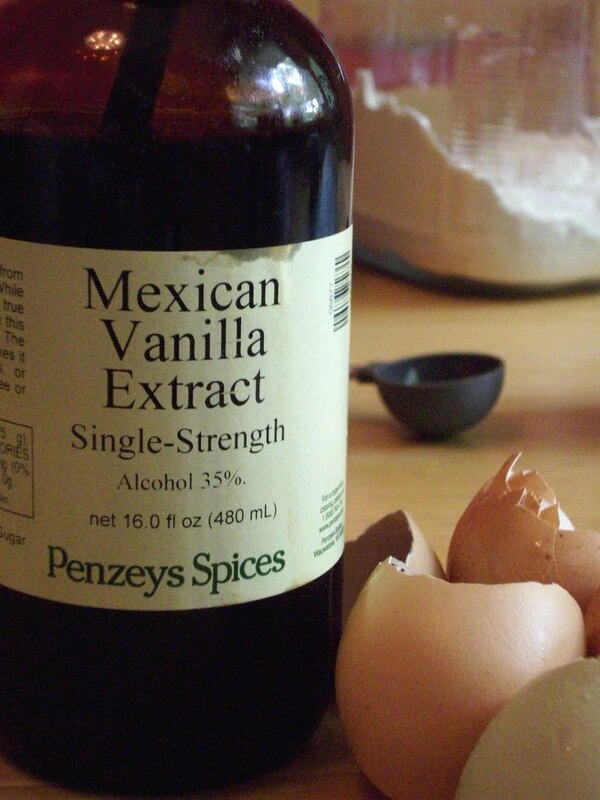 of their fabulous Mexican vanilla. I just saw it there on the shelf, lonley, large...and a much better deal than it's 4 oz. brother. Yes, I broke the bank and even hid the receipt from my husband. I could just hear him....."You paid $25.00 for a bottle of vanilla!" However, in my defense of spending $$$, I believe I have officially graduated to the level of Household Baker Extraordinaire and I deserve to have such an ingredient at my finger tips. Right? I am so glad I took the plunge. I have kissed goodbye to the days of vanilla-less recipes because of a lack of ingredient foresight. Gone are the days of getting half way through a recipe and sending my dear husband out for a tiny bottle of vanilla so I could finish the recipe. I can now say that I actually plan ahead and go over my ingredient list with a fine toothed comb so as not to end up let down due to a shortage of important ingredients! Just because, I stopped at our local library book sale.... some 6 months ago mind you. Just because, I found some old Gourmet, Cooks Illustrated and Bon Appetit Magazines for .25 cents...major score. Just because, I took them home and read them for a week straight, shelved them.... never making a single recipe from them until last night. 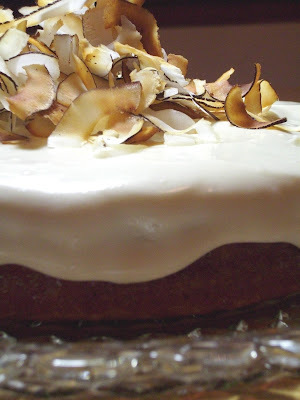 Just because, I decided to make the utterly gorgeous Coconut Rum Cake from September 2007 Issue of Gourmet. Just because, I did not read reviews of recipe on epicurious.com until AFTER I made the cake. Just because I have no self confidence..... I read the 50+ reviews of the cake.... split down the middle... you were either going to love it or hate it..... oh no....I am my worst critic. I sided with the cake haters on this one and worried all morning long that I was bringing in a flop of a cake to work.....nobody would like it. Just because, I drove all the way to work with one hand on the wheel, the other on the cake cover... so it wouldn't slip and the frosting wouldn't mess. Just because I want to... 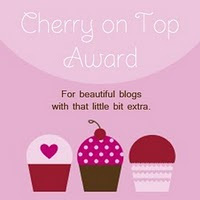 I recommed that you read reviews BEFORE you bake..... lots of tips... I went solo on this one- tips would have helped. Homemade Granola! Delicious, if I do say so myself! Wonderfully delicious granola! I have been trying and trying to get the recipe just the way I like it and I finally did. The smell of it baking is wonderful and warming to the senses. Warm vanilla and cinnamon aromas will fill your house while you wait. Granola is simple and good for you. It makes a fantastic snack and a wonderful breakfast cereal as well. Unfortunately it also costs a lot if you purchase organic granola at the store. Save some cashola $$$ by purchasing your oats in bulk as well as your flax seeds, coconut and slivered almonds. You can invest in some simple oils which you will end up using around the kitchen or just save them for your weekly granola making. 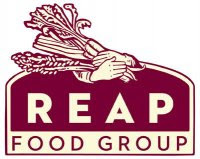 Ghee, coconut oil and grapeseed oil are kitchen staples around our kitchen. These oils retain flavor and nutrition when heated. You can add all sorts of tasty extras into the batch, make it just how your taste buds love it. 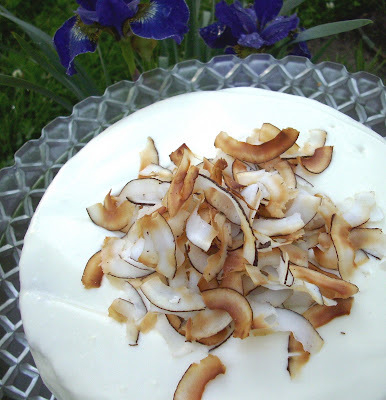 I use coconut, raw golden flax seeds, thick organic oats, and slivered almonds as my base. After several attempts at cooking this at 350 degrees, I finally have a good batch of time and temperature at 300 degrees for 50 minutes. 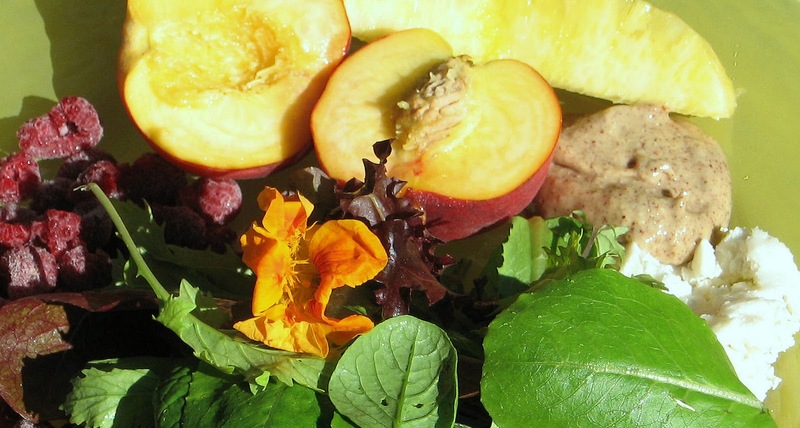 We enjoy our granola plain, or with mil/yogurt and fresh seasonal fruit! 3 TBS Brown Sugar (optional) this is sweet enough just with the syrup, adds more flavor than sweetness. Oven on to 300, line large rimmed baking sheet with parchment paper. Toss first four ingredients in large bowl. Melt over stove the oils and pour over mixture. Stir in Maple syrup, sugar, vanilla, cinnamon and salt. Stir well and place ingredients over the sheet and slip into the oven. Stir every 15 minutes and pull out at 50 minutes. Let cool completely and then store in Tupperware or other seal-able container.